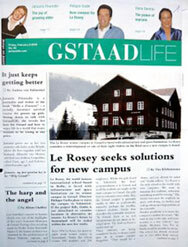 ‘In defence of the Russians,’ Gstaad Life, February 2008. In a recent GstaadLife editorial, Taki, Gstaad’s self-appointed gatekeeper and commentator, wrote an article entitled ‘The fabric of Gstaad’, in which he wonders if Gstaad is going to follow Courcheval, Chamonix and Verbier in becoming a playground for the Russian oligarchs and a Monte Carlo in Saanen. He blames the Russians for the problems in these resorts, referring to their hookers and drugs, and calling them vulgar and rude. However, he needn’t worry about whether the Russians are going to arrive in Gstaad, because they are already here. Many Russians and other nationalities have been offended by his article and have asked me, being part Russian and English speaking, to reply on their behalf. Now I cannot claim to have been in Gstaad for over 50 years like Taki, but we have been here since the 1960s. The Russians have also been here for many years. Roman Lakschin, who built his chalet in the 1970s claims he was the first Russian to build in the Saanenland, but there were Russians in Rougemont before that and the émigré Russians were good clients of the region’s hotels between the wars. In the last five years the Russians have arrived in Gstaad in greater numbers and they are the major spenders at Gstaad’s boutiques, they rent the chalets and yes, they are buying chalets. They are important clients of the hotels and particularly the Palace Hotel during Russian New Year. Andrea Scherz refers to them as excellent customers and has nothing but good things to say about them. In Soviet times languages were poorly taught and although the younger Russians are learning English at school and from MTV, the elder generations are embarrassed by their lack of languages and, whilst friendly if approached, they tend to keep to themselves and bear little resemblance to the caricatures referred to by Taki. Above: Many businesses around Gstaad are rolling out the welcome mat to new and regular guests from Russia. Above, a recent ad for the Cadonau store on the Promenade that appeared in the local German-language newspaper, the Anzeiger von Saanen…in Russian. Yes, the Russians like to spend their money but this will come as little surprise to anyone familiar with Russian history. Peter the Great (1672–1725) toured Europe spending on a prodigious scale and Catherine the Great (1729–1796) pioneered the buying of entire art collections en bloc for the Hermitage museum. The old aristocratic families such as the Yussupovs, Sheremetevs and the Demidovs were great spenders in Europe and the mercantile collectors Schukin and Morozov were early patrons of Picasso and Matisse. Taki goes on to lament that the Prada and Gucci boutiques are driving out the small local stores and mentions the recent closure of the butcher’s shop, implying that this and a lack of local children registering at the local school, because their parents have been driven out of the region by high prices, is somehow the fault of the Russians. Well, the butcher’s shop was closed because of competition from the meat counters of (Swiss-owned) Migros and Co-op and the local schools are in excellent shape with even the smaller villages like Turbach and Lauenen having healthy-sized classes and good morale. After a curious quote from Ruskin (where Taki presumes to know what Ruskin really means), Taki goes on to explain what he likes about the Saanenland, which is exactly the same as what the Russians and everybody else likes about it. He then reminisces about the past in Gstaad through rose-tinted spectacles, talking of a time when everyone knew everyone, respected each other and it was a sleepy, friendly place. Well, Gstaad has grown bigger, the chalets are larger and the season longer but the relationship between the locals and foreigners is still friendly but not familiar and the place hasn’t actually changed that much. He asks if we can expect multi-million-franc Simmentaler-style chalets next, but they are already here and the first CHF 100m chalet has just gone up on the Oberbort built by… …a Greek. The Russians asked me to point out that they have given the world the Bolshoi and the Kirov, Rachmaninov, Tchaikovsky and Prokofiev. For writers they put forward Tolstoy, Dostoyevsky, Turgenev and Chekov and for artists, Levitan, Malevich, Popova, Goncharova, Plastov and Korzhev. They suggest that next time Taki feels like savaging them in print he should put on a CD of Rostropovich playing Prokofiev’s Sinfonia Concertante, relax with a chilled bottle of pepper vodka and some Beluga caviar, before opening War and Peace and perhaps, while he ponders Tolstoy’s theory of historical inevitability, his mood might soften. And whilst the Russians acknowledge the achievements of the ancient Greeks including the Golden Ratio, Pythagoras, Euclid, the alphabet, the Parthenon and so on, they also ask what the Greeks have contributed to the world during the last 2,000 years, and not being able to think of anything, query what right Taki has to judge them and refer to them as rude, crude, vulgar and drug-addicted thugs. Ivan Lindsay is an art dealer, publisher and writer who lives in London and Gstaad. He writes on art and the art world for Country House, Millionaire, Spears Wealth Management Survey and the Art Book Journal.